They say the British prefer their steak bloody, almost most of them still eat it raw. However, here lies an English piece of meat ahead, that has been cooked through and previously depended rather well. One could almost say that this thing is really nice and dry. "Dry" is the right term for describing the sound of these four young men from London. Nothing is inflated, anything artificial and nothing pimped. Slab City sounds like a smelly rehearsal room, beer, sweat and honest work. Dry, groovy Stoner Rock, inspired by genre greats such as Dozers, Freedom Hawk, Fu Manchu or of course the almighty Kyuss, associated with a few spacey influences from the psychedelic Monster Magnet corner. 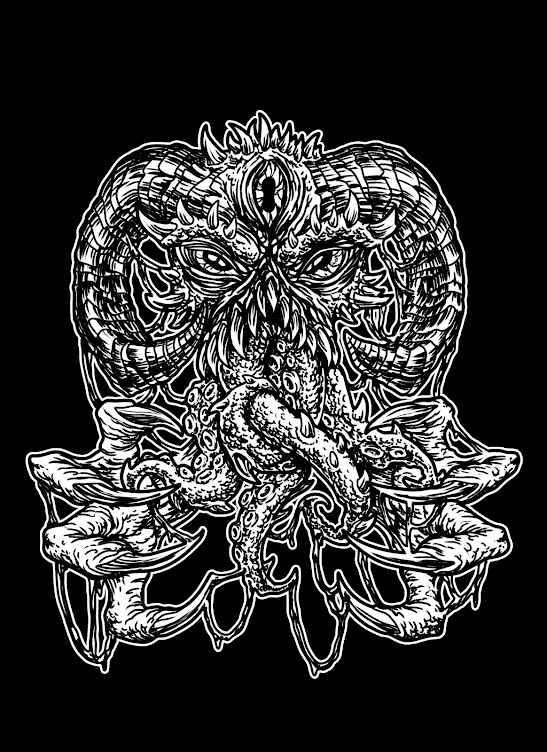 The band was founded in 2010, previously published two EPs, which kicked up dust, not only because of its immensely powerful songs but also because of their original comic artwork, with clear concept. The alter egos of the four band members fight in the comic strips, the evil forces of Evil Lazarus, and these sometimes very humorous stories will of course find their way into the lyrics. STEAK - certainly not an everyday Stoner band. 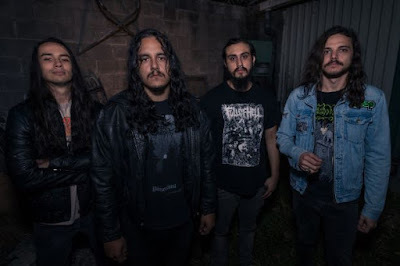 Within a short space of time, Steak has risen to the top of the UK Stoner Rock scene with their blistering and sometimes humorous take on the Desert Rock/Fuzz/Stoner Rock genre. Steak have released two critically acclaimed EPs with 2012's Disastronaught and 2013's Corned Beef Colossus which was produced by Truckfighters – Mr Ozo. Plus they have a formidable live reputation. 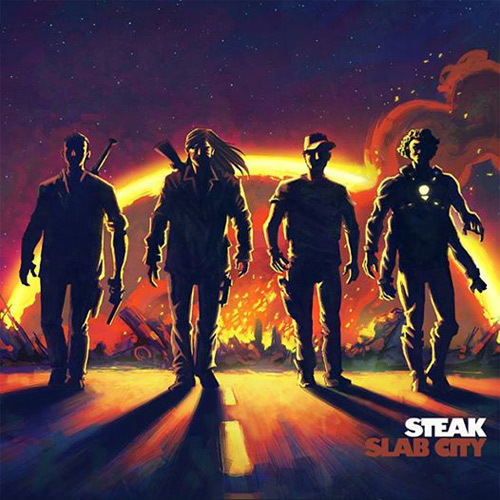 Newly signed to Napalm Records, Steak announced earlier in 2014 they would be recording their debut album – Slab City. Slab City is finally here. Has it been worth the wait? You betcha. This is the Stoner Rock album of the year for me as Slab City is a heavy dosage of finely tuned heavy riffing Stoner Rock of the highest order. Steak have outdone themselves here. This is Steak's calling card to the big time as this album is a pulsating 48 minute blast which fans will be falling themselves over for. Seriously its that great. Opening track - COMA - starts with an ambient-based slow desert/fuzz rock riff before the lead vocals of Kippa come screeching in to awaken you from a very deep sleep. The riffs are played at a loud and almost bone-crunching level, as Steak don't mess around here. They are pumped up and primed to destroy everyone that stands in their way. COMA is a great way to start the album. The next track is a re-recording of an old Steak classic - Liquid Gold from their last EP. Don't worry folks, as this is a slightly reworked version, which runs about 10 seconds longer. The old magic of the original still shines through from time to time but this is more Liquid Gold version 2.0. Shades of Kyuss and Truckfighters may be recognised by some listeners. Its still one of the finest songs that Steak have written so far. No wonder they included it on Slab City, as they know how to please their fans. Steak have added a more spacey atmospheric vibe to their music, which evokes memories of Monster Magnet in their prime. Though its too Steaks credit the album definitely has its own feel and sound to impress you with. 3rd track - Slab City is a fast paced grooving riffing machine that will have you being apart of Steak's vision 100%. There is no turning back. Just sit back and enjoy the round. The fuzz rock overtones will take you to a completely new level of excitement. Steak have called upon some of their famous pals and direct influences to help deliver one of the albums standout tracks. An epic 7-minute track packed full of twists and turns that prove without a doubt why Steak are so highly thought of with Kisser. They must be as they duet with a Stoner Metal legend. The one and only - John Garcia - who lends his trademark soulful grizzly vocals to this storming track. It has shades of Kyuss running through its veins but with a more atmospheric space rock guitar drifting through. Just close your eyes and embrace the magical vision of Kippa and John laying down some epic vocals. Like their previous two EPs, Slab City has a distinctive Science Fiction vibe with a slight nod to Superheroes. Its what their EPs were built around. A cool concept of going against a power crazy warlord. Though the story is very different here. But the main focus is the music. Slab City is one highly addictive drug that is very hard to give up. Tracks such as Roadhead and Machine carry on the rich desert rock sun vibes to their natural conclusion. Mainly more powerful riffs and groove based vocals from Kippa. Machine is another reworked track from their previous EP - Corned Beef Colossus. It's slightly heavier than the original with the music blasting way through your speakers. The albums standout track has to be the 8:11 minute epic track - Rising - as it sees Steak fuse blistering Stoner Rock anthemic vocals finely tuned Space Rock riffs once more for a track that will soon get under your skin. It may start very quietly but as time moves on, Steak start to add different noises and sounds to the mix including heavy distorted voices. This gives this track a cold and calculating mysterious feel. Though it's the excellent Stoner vibes that really shine through. Steak have delivered an excellent and powerful debut album that will see them rise to the top of the UK Stoner Rock scene and beyond. Steak have the potential to influence the next generation of Stoner Rock outlaws. Slab City is a must have album. It's the Stoner Rock album of the year for me. No question. Thanks to Mona at Napalm Records for sending me a copy. Slab City will be available to buy from the following dates on CD/DD/Vinyl on Napalm Records.